Intelligent-They are self-aware as much as you and I, as well as having an excellent perception of their earthly surroundings. This type of spirit can interact with the physical world enough to actually move small objects. Many times they will attempt to make contact with the living, EVP recordings of the interactive variety showcase this quite well. 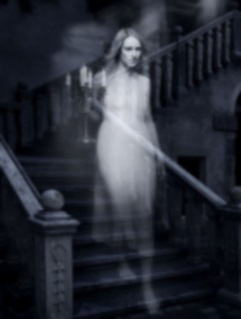 Poltergeists- They share many characteristics of intelligent haunts. However these spirits in many occasions will attach themselves to, and feed off of the energy of a particular person. Many times being teenagers in volatile emotional states. They are mischievous and/or violent in nature. The poltergeist's claim to fame is their unique ability to stunningly move objects in a much more demonstrative fashion than your average ghost. The reason these spirits are able to manifest such strong powers of levitation over objects probably is directly related to the fact that they have learned to manipulate the energy of humans to their benefit. Residual-These are simply images and whole events from times past that replay themselves over and over. They are thought by many to be caused by trapped psychokinetic energy; possibly becoming that way due to tragic circumstances, but for reasons still not fully understood. Residual haunts do not seem to notice any other person, thing, or event going on around them. If new walls are built in a particular residual area, the ghost will walk directly through them. Unfortunately since no consciousness remains, these haunting's can never be encouraged to leave, only understood and learned to live with. Inhuman spirits-They are bad news. These entities were never humans, and may feed off of the negative energies of people they encounter. They are often very powerful and evil and demonstrate abilities above and beyond that of any human spirit and are referred to by many as demons or evil spirits. Help with a Ghost Haunting. EMF, EVP, Ghost Investigation, Paranormal and Demonic help. Poltergeist, Mediums, Ouija Boards. Types of Ghost, Signs of a haunting, Portals, Blessing. Home Exorcism and Personal Exorcism. Leading Exorcist in the Phoenix Metro Area of Arizona. Number one person to call for an Exorcist on a haunted Home to get it cleansed fast. Number One person to call on a possessed person to get an Exorcism fast. Bishop Barry is the Top Professional Exorcist In Arizona.